Secretary-General António Guterres attends a ceremony in Bamako, Mali, honoring all fallen peacekeepers on the International Day of UN Peacekeepers. The north-west African country is the most dangerous place in the world to be a UN ‘blue helmet’, and last year, 21 troops serving with the UN Stabilization Mission in Mali (MINUSMA) lost their lives, together with seven civilians. 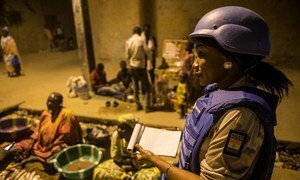 UN News has a team in Mali to cover the special visit, and shortly after arriving in the capital, Bamako, the Secretary-General attended a poignant ceremony at MINUSMA’s base in the capital, to pay tribute to fallen peacekeepers. He laid a wreath at the memorial inside the camp, engraved with the names of those killed in the service of peace. “Dear peacekeepers, you have demonstrated that you are capable of all forms of sacrifice. For many of your colleagues, this has meant the supreme sacrifice of giving their lives, to protect the lives of Malian civilians,” Mr. Guterres said at the ceremony. “I want to thank you very much for this effort, these sacrifices, to pay tribute to you, and to say how proud I am to work with you”. “As peacekeepers, you are the foremost symbol of the United Nations itself”, he added. Secretary-General António Guterres lays a wreath to honor peacekeepers killed in the line of duty while serving with the UN Multidimensional Integrated Stabilization Mission in Mali (MINUSMA). The ceremony took place at a MINUSMA Operational Base in Bamako. The Special Representative of the Secretary-General in Mali, and Head of MINUSMA, Mahamat Saleh Annadif, said that honouring the fallen “warms the hearts of their comrades and encourages us to continue to defend even more resolutely the values ​​of the United Nations”. Mr. Guterres also awarded medals to two peacekeepers serving with the mission, for their outstanding service: Commander Olufunmilayo Ajibike Amodu, from Nigeria, and Major Mohammad Badrul Ahsan Khan, from Bangladesh, a military staff officer based at Force headquarters. “The terrorists are not relenting in what they are doing. And obviously, we are not backing out in what we have come to do”, she added, pointing to the worrying security situation in Mali, particularly in central and northern areas where most of the continuing violence between different armed groups and government forces is taking place. Troops with the mission have increasingly become the target of attacks. For those interested in serving as ‘blue helmets’, Commander Amodu had this message: “The UN is all about peace. And when there is peace, there is development. When there is peace, there is promotion of technology. When there is peace, every other thing works the way it should work. And for any person who would want to join MINUSMA, you should have in the back of your mind that when you are coming, it is to support the peace process”. Major Khan told UN News here on the ground in Bamako that it was “a matter of pride and honor” to receive the medal. “In this world, we have to be all together. So, for better living, we have to ensure the peace. There is no better alternative to supporting each other”, he said, adding that “MINUSMA is a unique opportunity to serve”. Mr. Guterres is being accompanied on his two-day visit to Mali by Under Secretary-General for Field Support, Atul Khare, the head of UN Peacekeeping Operations, Jean-Pierre Lacroix, and the Executive Director of UNICEF, Henrietta Fore. The UN chief was greeted at the airport by Malian President Ibrahim Boubacar Keita, who he was scheduled to meet later in the day. During his visit, Mr. Guterres will also meet other Malian officials, as well as United Nations staff working in the country. UN Secretary-General Antonio Guterres is welcomed on his arrival in Bamako by Ibrahim Boubacar Keita, the President of Mali. On Wednesday, the Secretary-General is expected to visit the regions and to meet with local authorities and UN staff, as well as women, youth and religious representatives.